Registration for the Bible Institute Module 1 in January 2016 is full and is now closed. If you are interested in joining a future Module 1 class, please contact us by phone or email to show your interest and we will schedule a new class when there are enough potential students. Thank you. 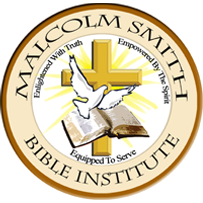 Malcolm Smith Bible Institute will be starting a new class with Module One taking place in January 2016. Module one of Malcolm’s Bible school only comes along every few years and is the foundation for the seven 15-hour Modules that follow. After Module one is complete, we work with the classes to schedule future modules based on their schedules. Most classes stay together and graduate together after the completion of all 8 Modules. MSBI culminates in a graduation ceremony and banquet where Malcolm and Nancy present the diplomas and we all celebrate the end of a long journey together with food and fellowship. For more information on the Bible school, the Modules, or anything else visit the main MSBI ‘about’ page here. For registration fees or to sign up, visit the registration page.